The truth is not pleasant but I may have hypertension. 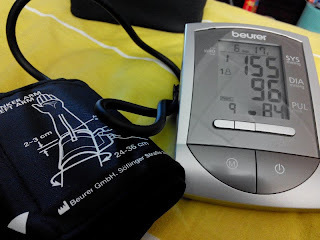 My cousin gifted me a blood pressure monitor for me to check both my husband's and my own blood pressure and sadly my blood pressure reading came out high several times. Blood pressure is measured by comparing the pressure of the blood in the artery – usually in the arm – against a column of air or mercury in a calibrated tube. The normal blood pressure of a healthy person is 120/80 mmhg. However it may vary between 100/60 to 150/90 depending upon the various activities. Any deviation be it a higher or a lower, it always poses a risk to the individual. Prolonged high blood pressure, really poses a serious threat to all the individuals. It may leads to stroke and heart attack. Heart failure, eye damage and kidney disease can not be prevented if the blood pressure remain high for a prolonged time, unchecked. It may also lead to atherosclerosis. Atherosclerosis will causes all the vital arteries to narrow, restricting the blood supply to the heart, brain and other major organs and it may cause death. if your top number is 140 or more - then you may have high blood pressure, regardless of your bottom number. if your bottom number is 90 or more - then you may have high blood pressure, regardless your top number. if your top number is 90 or less - then you may have low blood pressure, regardless of your bottom number. Family history: It has been observed that blood pressure has been passed down from generation to generation. If you have a history of blood pressure in your family, then you are more prone towards it. Age: With the increase of age the chance of blood pressure activated. In fact it is more prominent in adults and elder. Activity: If you are leading a more stressful activity, then you are more prone towards blood pressure. Weight: Weight is directly proportional to high blood pressure. Diet: Diet has a vital role in controlling the blood pressure. A diet enriched with fat and sugar increases the chance of high blood pressure. Alcohol & Smoking; Studied has revealed that, people who consumed alcohol and smoke are more towards high blood pressure. In fact both of them are independent risk factor for heart attack. The first and foremost sign of a high blood pressure is dull pain in the head or the neck on waking up in the morning. If this condition persists for a long time then be careful because it may leads to worsen. You could also feel nosebleeds, dizzy spells, breathing difficulties, frequent urination, fatigue and nervous tension. If you are experiencing any of the above signs and symptoms, then immediately consult a doctor for medication. Or else it could be dangerous.